Monday is our day off at the school, but we needed a break from homework. The guys got together to do some work on the car but then decided to pull a little weeds once we got to the D house. Well one thing led to another and we started creating a new parking space for an extra car. Kayo just got her drivers license, so now she has a place to park her car. We are taking more ground for Jesus literally. So, now you can clearly park two cars instead of one. Praise the Lord guys, and thanks for your hard work. On Sunday evenings a group of students head out to Camp Foster and help lead their youth group on base. It is a real blessing for the students, they are beginning to see the group grow physically and Spiritually in the Lord. Daniel and Aaron switch off every other week in teaching. The month of October is Pastor Appreciation month, so we celebrated after the morning service at CCGinowan. It was such a blessing as people came and brought dishes to share with everyone. The early church in the Book of Acts came together to share meals, and that is exactly what we did. We were taking our meals with gladness. Paul and Barnabas (Trevor and Josh) showed up with some homemade pizza, it was outstanding! Last night we headed out to Mihama, passed out tracts, and worshipped the Lord. It was a blessing! We joined up with another christian group and ministered together. Pictured above is Hakugaijin playing their set, they sound awesome. It was such a blessing to meet people, share the Lord with them, and minister the Love of Jesus Christ. We prayed for a young man who gave his heart back to the Lord, God is so good. Saturday night, Joanna and Ayu got together to make apple pie from scratch. They pealed and backed the apples (with the help of Hannah and Michal) made to crust, baked and whala! Delicious apple pie. It was so oishi (delicious). Since it is Pastor's appreciation month, we let Pastor Tim get the first piece. It is amazing the things that you can do on the internet today. Daniel Sedota stays in contact with CCLivingwater's youthgroup via the internet. Every Saturday morning Daniel gets one of us to give a devotion live via the internet to the youthgroup back in California. Jon Horne at Livingwater brings us in through their webcam and we see and communicate via livecam. It is 11am Saturday morning Okinawa time, but 8pm Friday California time, this stuff is incredible. Pastor Tim is such a blessing, he is helping the students learn Nijongo (Japanese). Twice a week the students are taught for one hour. Already they know both Japanese alphabets (hiragana and katakana) and they are learning Kanji. Their homework is now all done in Japanese. Well, most of the students, Pastor Tom is far behind. But the rest of the students are learning leaps and bounds. At the Chaplain's Ball as well as all of the Marine Corps functions, they always have these huge cakes. This thing can feed an army! As you can see, not much of it was eaten, most everyone ate the cheesecake, but this cake tasted good! As you can see in the upper picture, this Marine liked it so much he could hardly keep his seat. Double click on the pict to see who this guy is, he can sure cut the rug. This year Chaplain Charlie Owens invited Joanna and I to be their guests at the Chaplain's Ball that was held at Camp Hansen. It was a blessing to see the heritage and the important role that the Chaplains have in the U.S. Military. Pictured below to the right is Chaplain Keith and his wife. In the upper right hand corner is Chaplain Owens and his wife Mara. It was a blessed night. At the Chaplain's Ball, Nate and Joshua were there, these guys are a real blessing. We took this picture right before we had dinner. If you double click on the picture above, you can see these two tough guys with their battle faces on, these guys are two tough hombres. For many of you, you have heard about the intense fires that are happening in Southern California. Joanna's sister Cindy, sent us these pictures in an email. Cindy's husband Ted works for the City of Corona' Fire department and they have sent many men to help in this emergency. It is amazing to see the intensity of these fires. Double click on the pictures to see details and how many of the homes went up in flames. Most importantly, please pray for our brave firemen who are risking their lives out there in the flames. Also, pray for the thousands of people who have been left homeless, that they would have provision during this time of loss. During this time, the church needs to step up their efforts and help those who are in need. Pictured above is Aaron who teaches the class "life of David". They recently completed their midterm tests, and now the teachings continue on. Aaron is doing a great job as one of the instructors at CCBC Okinawa, it is such a blessing as he is always prepared to teach his class. It is such a blessing, Tom is originally from Australia, but he comes to us via Tokorozawa. 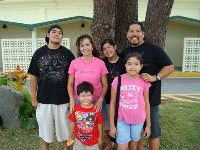 Tom has been with Pastor Travis for over 1 year but has now recently transfered over to us here in Okinawa. Tom has been with us before, about 6 months ago, he came with Travis as he taught at the Worship conference here in Ginowan. Well, it is a blessing to have Tommyboy with us, we look forward on how the Lord will use him in the future. Kayo has her Japanese drivers license! She passed the test, Praise the Lord! So watchout everyone on the road, here comes Kayo. But in all seriousness, great job girl. God bless you. Tuesday night after Revelation class, we were blessed with a visit from a group from YWAM. In the center picture some of you might remember Maria from OCSI (Okinawa Christian School). She is the third girl from the right. It is a blessing to see her still on fire for the Lord. They will be in Okinawa for about 4 weeks, please pray that their visit here will be real fruitful. This week Kayla encouraged us in the Word, it was a real blessing. Every morning we begin school with one of the students giving us an encouraging devotion. We are so blessed with the opportunity to begin each day in the Word of God. Josh, Ron and the students headed out to Kokusai street and went shopping. They spent some money buying new outfits. These outfits are quite comfortable and can be worn for any occasion. Today, they are sportin them for Bible Class. Don't worry folks, they are not professional ninjas. The Neely is a real talented guy, but most important he is filled with God's Holy Spirit. It was such a blessing hearing him lead at w2. For those of you who do not know Andrew, he is from Iowa and learned Japanese there. He is now using that language to connect with the Okinawan's here on the island. He feels a call of God to stay here for now, please keep him in your prayers, that he would continue to grow in the grace and knowlege of our Lord Jesus Christ. Asa had his official "Incredibles" birthday party! He had fun inviting his family and friends. We had a great BBQ and ate a homemade icecream cake. Everyone had a blast! Being a kid is so much fun, Happy Birthday Asa, we love you! Today we had the opportunity to check out a new building that is for rent in Ishikawa. It does not look that good from the outside, but the potential is huge! Most of the work is just cosmetic and can be transformed into a beautiful place over night. Well, we put an offer to the owner and will have to wait and see if they accept it. It could be a beautiful place to start a new Koinonia Cafe. Please join us in prayer, if this is of the Lord, we want to go full steam ahead.